Aging in Hawaii is an educational outreach program sponsored by Attention Plus Care with the mission to provide resources for seniors and their families. Classes are free and instructed by a Registered Nurse covering a wide variety of topics each month. Every year, more than 6,000 Hawaii residents are diagnosed with cancer, and more than 2,000 die from the disease. Hawaii’s cancer treatment spending costs reaches about $678 million annually. In Hawaii, the five most commonly diagnosed cancers in men are prostate, lung, colorectal, bladder, and melanoma. In women, they are breast, colorectal, lung, uterine, and thyroid. Some population groups have higher rates of cancer than others. For example, Native Hawaiian women have higher rates of breast cancer than other population groups. 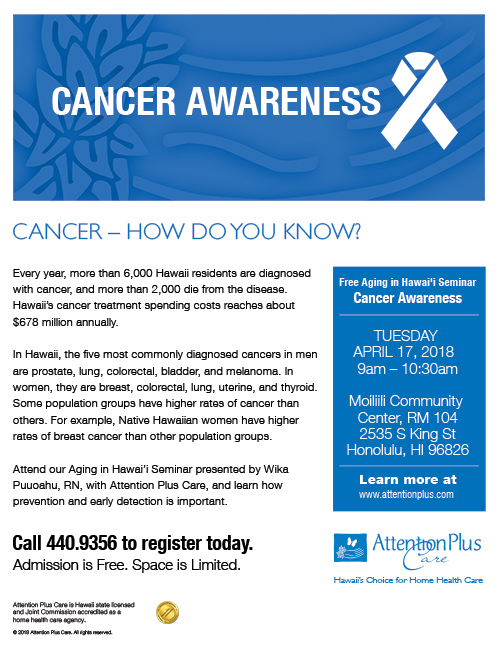 Attend our Aging in Hawai’i Seminar presented by Wika Puuoahu, RN, with Attention Plus Care, and learn how prevention and early detection is important. To request space in our current class, please fill out the form below. Every 5 hours in Hawaii, an older adult has a fall injury so severe they must be treated at a hospital. Recent reports show Hawaii seniors are visiting hospital emergency rooms on a rate of every hour, 24 hours a day, seven days a week. Many never go home or regain full independence. The GOOD NEWS is that falls and fall-related injuries are preventable. 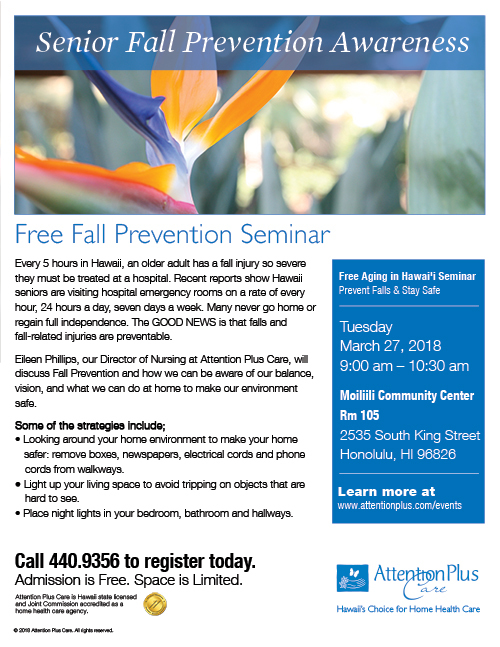 Eileen Phillips, our Director of Nursing at Attention Plus Care, will discuss Fall Prevention and how we can be aware of our balance, vision, and what we can do at home to make our environment safe. A heart attack or myocardial infarction (MI), occurs when a part of the heart muscle doesn’t receive enough blood flow. The more time that passes without treatment to restore blood flow, the greater the damage to the heart muscle. Every year, about 790,000 Americans have a heart attack. 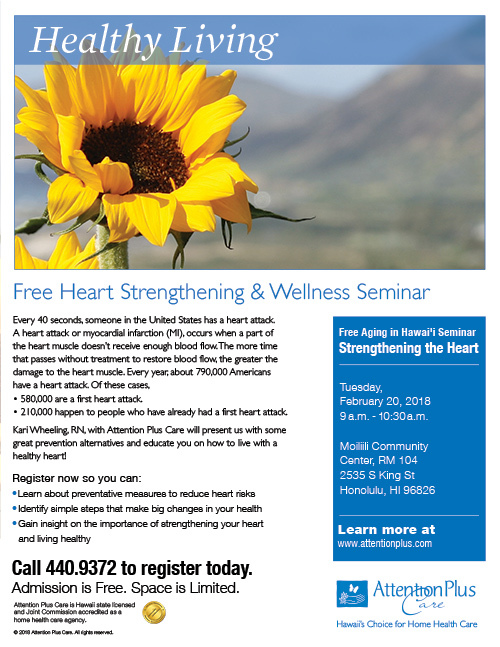 Kari Wheeling, RN, with Attention Plus Care will present us with some great prevention alternatives and educate you on how to live with a healthy heart! Someone in the United States has a stroke every 40 seconds. Every 4 minutes, someone dies of a stroke. Know the warning signs so if you or someone you know might be having a stroke, you can act fast. The chances of survival are greater when emergency treatment begins quickly! During a stroke, every minute counts! By knowing the signs and symptoms of stroke, you can take quick action and perhaps save a life—maybe even your own. 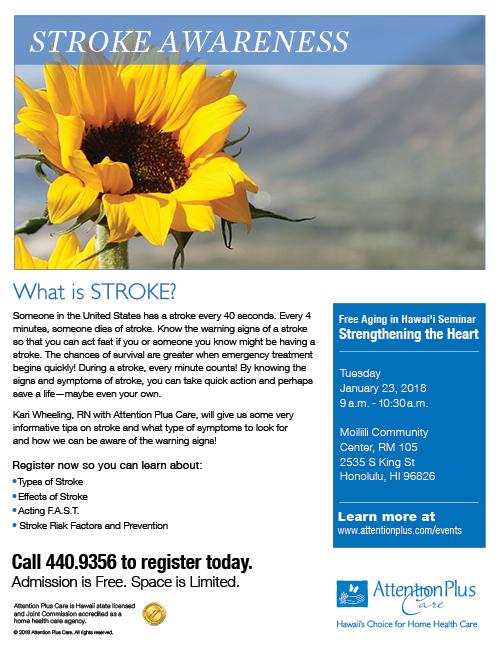 Kari Wheeling, RN with Attention Plus Care, will give us some very informative tips on stroke and what type of symptoms to look for and how we can be aware of the warning signs! One in every five adults suffer from arthritis and it is the nation's leading cause of disability. Attention Plus Care is committed to raising community awareness through our Aging in Hawaii program, and helping to educate Hawaii's senior population and lessen the impact of this serious, painful, disease, which can rob people of living life to its fullest. 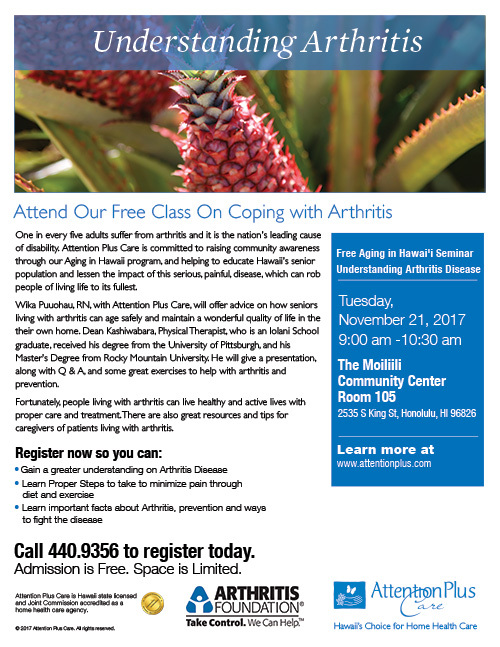 Wika Puuohau, RN, with Attention Plus Care, will offer advice on how seniors living with arthritis can age safely and maintain a wonderful quality of life in the their own home. Dean Kashiwabara, Physical Therapist, who is an Iolani School graduate, received his degree from the University of Pittsburgh, and his Master's Degree from Rocky Mountain University. He will give a presentation, along with Q & A, and some great exercises to help with arthritis and prevention. Fortunately, people living with arthritis can live healthy and active lives with proper care and treatment. There are also great resources and tips for caregivers of patients living with arthritis. Filling out this form does not guarantee seating in our current class. You must receive notification from Attention Plus Care confirming your attendance. Information contained in this form is used solely by Attention Plus Care and not shared or sold to any other entity. 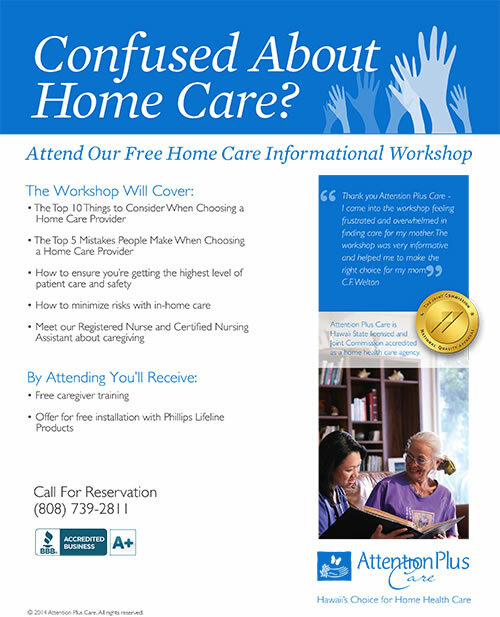 Workshop: Confused About Home Care? Attend this informative and free workshop on Home Care and learn about the many choices available for receiving care at home. Workshops are offered twice monthly and are small in size to encourage participation and personalized attention. Sessions are led by a licensed professional experienced in home care and topics on Aging in Hawaii. Friends and families are welcomed to join in! Please take a moment and fill out this form to be registered in our next Home Care Workshop. Some one will call you to verify your appointment.